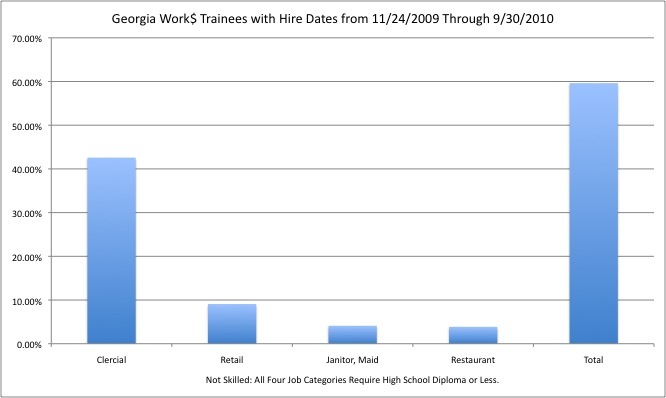 Is the Georgia Works Program a Failure, How Could We Tell and Would We Even Care? Congressional conservatives such as Eric Cantor like the program, so there’s a good chance it might pass. I actually missed the debate about this from a few weeks ago — Zaid Jilani at Think Progress has a summary of some pros and cons from the time. I’m fascinated by the terms under which people might justify this as a good program or would say it is a failed program. Its ideology works well for people who are concerned that our workforce lacks the training for 21st century jobs: it allows workers to brush up their skills at no wages so they’ll be prepared to take on a job at the end. 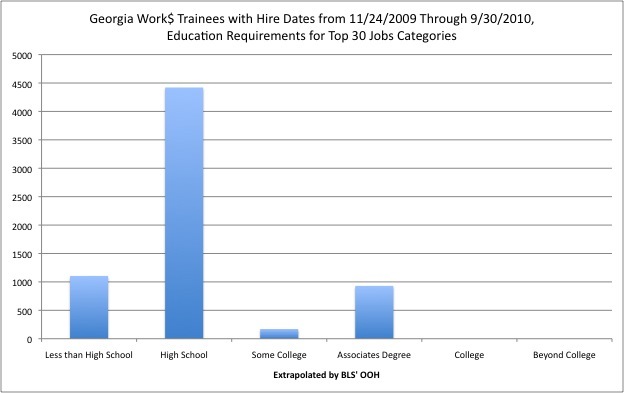 But even a quick glance at the underlying data shows that, instead of a program to jump-start education and training for skilled jobs, it looks like the Georgia Department of Labor is running a low-skills temp agency out of its UI fund for the benefit of employers. How would you use the data to justify taking this program to a large, national scale? There are three hypotheses I can imagine being in play, and all of them turn out to have major problems. Census Bureau data show that in 2007 and 2008, 15 percent of Georgians who’d been out of work for six months or longer found work within one month of a survey, according to Jesse Rothstein, an associate professor of economics and public policy at the University of California at Berkeley. In 2009 and 2010, the number fell to 10 percent. So the transition from unemployment to employment looks to be very similar between those who do the program and those who don’t, with the big difference being that those who do the program spend upwards of 24 hours a week working for free. Around 70% of Georgia Works participants are women. In so much as the workers in this program will have low skills and thus low resources (more on this in a second), it is likely much of their “leisure” time is spent on child care, uncompensated work in the household, or economizing household purchasing power — there probably isn’t much superfluous time to just give away to employers. Hypothesis two, the most important one, is that these jobs require unique skills and the potential workforce doesn’t have the right ones. Thus a special training period is necessary. What kind of jobs would these be? They would require more education than normal low-skill jobs. They would be jobs that are difficult to be productive in right away. They would involve new technologies, especially in manufacturing, that go beyond the normal workforce. They would cluster in the “some college” category at least. found employment between November 24, 2009 and September 30, 2010 shows two-fifths found jobs doing general clerical work. Hundreds more found jobs as non-professional child care workers, janitors, retail sales persons, restaurant and fast food workers, hotel clerks and maids, or drivers and chauffeurs. 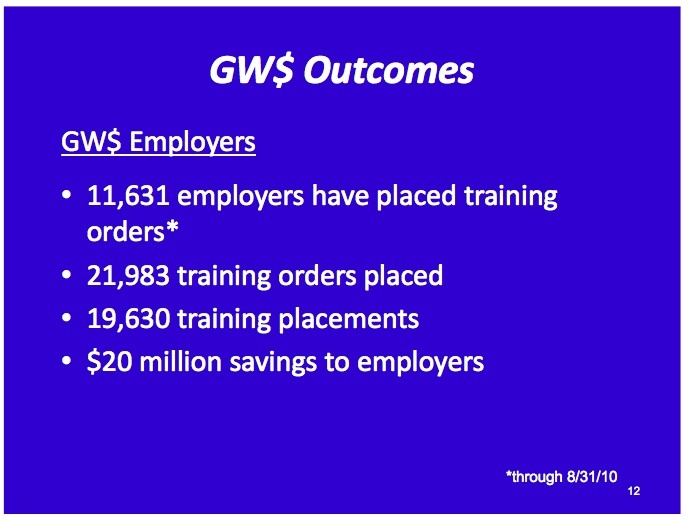 In total, 70 percent of the trainees hired after the end of the training program found employment in these or similar low-wage jobs. What does this tell us? All of these jobs, according to the Bureau of Labor Statistics’ (BLS) Occupational Outlook Handbook (OOH), require a high school diploma or less. They are all jobs that are “de-skilled”: the types of jobs someone can go into and out of and be relatively productive at day one. Many of them are high churn, high turnover jobs. Indeed, they seem more characteristic of a temp agency than an institution that is focused on jobs that require skills to accelerate productivity. Among the top 30 jobs in Georgia Works, it is more likely that a given job will require less than a high school diploma, or no formal education, than it would require an associate’s degree. They are more likely to be jobs like janitors, restaurant servers, and maids than those that require new skills and specific training unique to the new century. Even the high school level includes a lot of jobs — clerical work, storage warehouses, drivers, retail — that allude more to temp agencies than high-tech. A third hypothesis is that workers will make more money if they are hired through this program than through normal job searches. In this hypothesis, giving labor away is a sign of being a non-shirking worker and employers will largely compensate back the lost hours in the post-hire salary. If, after examining the data closely, you can go around telling employers that they are saving over $20 million dollars — savings that must come from not paying salaries — it’s hard for me to think that it ultimately nets out back to workers. So I could say, “This certainly looks like a way to run a low-skill temp agency giving weeks of free labor to employers, employers who already probably have monopsony power and labor that is effectively deskilled, with taxpayers picking up the tab.” A neoliberal would then respond, “Well this program gives people the market dynamism of the choice to be choosing in the market of choice for the market of uncompensated labor, a choice market that synergizes with employer’s full choice of market wages,” and in our age that would somehow constitute a strong retort. Repeat that enough and the policy fellowships will just start falling into your lap. But we have to step back and think: What kind of labor contract do we want the government creating, encouraging, and setting boundaries on? I’ve been discussing how our laws, courts, and institutions create the free-floating notion of a “free” labor contract. For all the talk about “choice,” this program nudges people into working for free in what are likely already difficult, exploitative markets. What are already high-churn industries will now have wages depressed even further from taxpayers subsidizing unpaid labor. And the ideas that derive from it — that the problem with our economy is that workers are lazy and stupid rather than that the fact that there are no jobs, that employers should get more claims on work for free and that the spirit of indenture should be strengthened in the workplace — are the ideas that liberals have to fight against in these dark times. 6 Responses to Is the Georgia Works Program a Failure, How Could We Tell and Would We Even Care? Is there any data on whether participants in the program who are not hired by the training employer are subsequently hired at a higher rate than the control group? In other words, is the training worth something on the open market? Good assessment of the program. I appreciate your characterization of neoliberal scholarship, as it seems like so much of these institutions (Such as Mercatus at my university) engage more in marketing than they do in answering or asking hard questions. Tim: One of the most telling and revenge-worthy actions of the conservative movement has been to conflate the meaning of the words “scholar” and “shill.” As in “American Enterprise scholar.” Not that Brookings is any better. Leave it to Georgia to develop a 21st Century Workhouse. That said, Georgia’s failings do not mean a similar program couldn’t work. The local Workforce Investment Board, for whom I work, provides employer subsidies for hiring – AND TRAINING – employees through an “On-the-Job Training” contract, or OJT. Under the contract, employers must provide training that leads to a measurable skill increase and a raise in wage at the end of the training period. In return, the employer receives 1/2 the trainee’s wage during the contract period in cash. While there is no outright requirement to retain workers after the subsidy period, employers who do not retain employees (unless there are legitimate grounds for dismissal) are not considered for future hires. Most of the OJT contracts we write are for good paying production occupations and all – by design – result in the attainment of marketable skills. There is nothing that says that the new program could not be designed to follow the same rules.